I tried to do laundry on Tuesday, but I ate sliders and listened to records instead. I tried to help Elliot not hear fireworks by blaring music, but he couldn’t ignore them no matter how loudly I blared Otis Redding’s romance tunes. I tried out a new dance move in front of the mirror, but it looked way cooler in my head, and now I think I should probably keep dancing to myself, in my apartment, when home alone, or just stick to the slow-dancing thing. I tried to do the dishes every night, but instead I ordered carry-out and watched tv shows. I tried freezing a coffee and coconut milk popsicle concoction, but somehow all the coffee flavor sunk to the bottom (or top) while freezing. 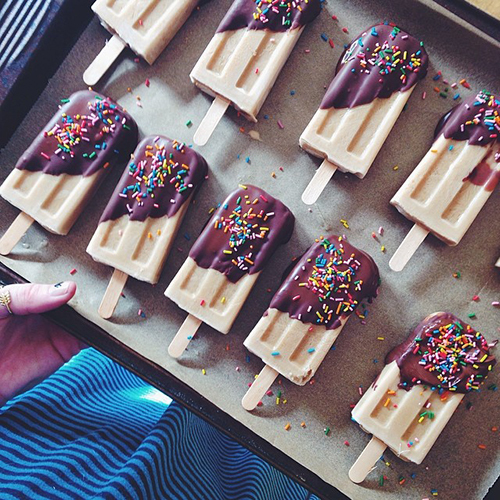 So I’m pretty glad that when I tried making these popsicles, they worked! These coffee pops are lightly sweet and coconut-creamy. The chocolate mocha-fies these in a respectable way. The sprinkles give them a crunch and a prettiness that I just can’t ignore. I like to eat them for a post-work pick-me-up. (Holy hyphenation.) I like to eat them in the backyard near my tiki fence while people walk by and Elliot curses at them as only a 14 pound dog with serious sass and a heart of gold can. So, now I want to make them peanut butter (probably because of Nicole) and I want to melt ice cream to freeze in a pop (probably because of Cindy) and thank goodness summer just began because I want to try to make plenty more pops this season. 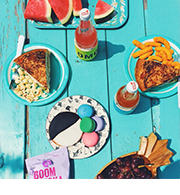 Check out all the other Popsicle Week Dreams right HERE. Whisk together the coconut milk, coffee, maple syrup, and vanilla. Taste and add more coffee or maple syrup to taste. Fill ice pop mold, insert sticks, freeze overnight. Melt together the chocolate and coconut milk in 30 second intervals in the microwave until smooth. 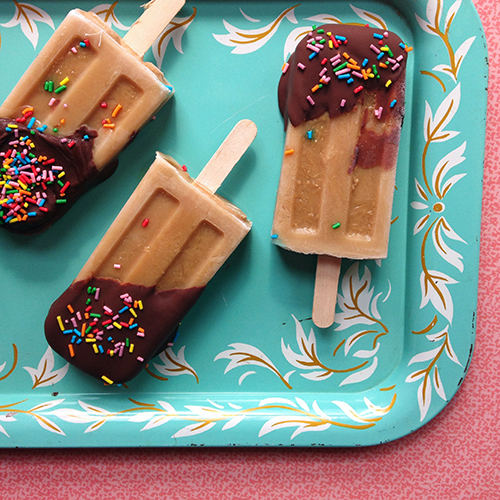 Remove popsicles from mold, Dunk in chocolate, add sprinkles, place on a parchment lined baking sheet. Pop in the freezer until solid. Serve right away or store in a sealed container in the freezer or zip-top bag. Enjoy in lieu of coffee in the morning or afternoon. 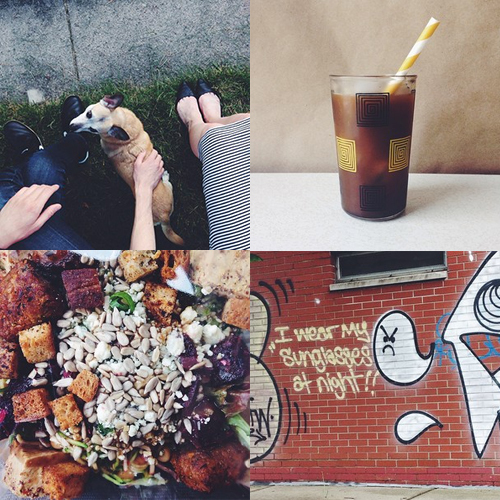 (and failed popsicle attempt), giant salads, and sunglasses erry day. P.S. All of these photos were taken with my iPhone 5 and edited with the VSCO app. These are amazing, love the flavors!!! These look so good! I love that they are dipped in the chocolate! My little dog is such a sass monster too! Love these flavors! Can’t wait to see what other pops you make! YES! I’m glad you got your pop mojo back! I made a really bad batch last year that tasted like nothing at all. I might as well have freezed water. These look SO GOOD. Chocolate dipped and sprinkles for life! First mistake: practicing new dance moves in the mirror. It almost always never turns out well. I blame So You Think You Can Dance for making me think that I can dance… turns out, I’m just awkward. These posicles look dreamy! How can you not want something that is dipped in chocolate and covered in sprinkles? Huzzah! Love!! One of my favorites so far for Popsicle Week! Sometimes you just need a chocolate dip and some spranks to make everything better! Love that these are dunked in chocolate!! A peanut butter version would be soo delicious. 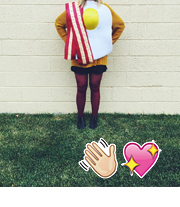 this mocha combo sounds like my perfect jaaam. 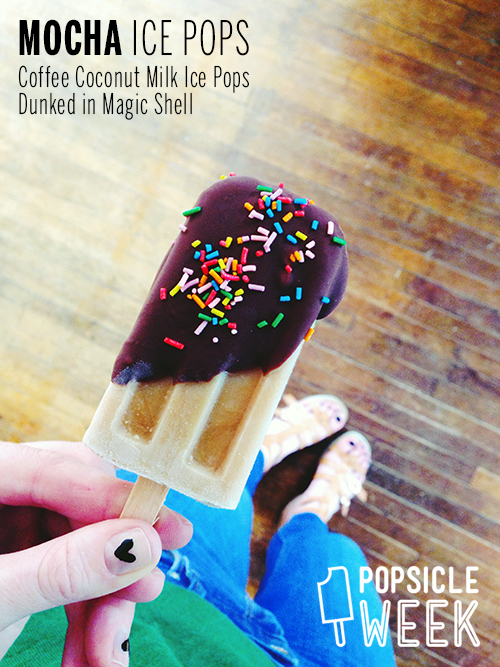 also chocolate + sprinkles makes any pop better. I’ve been to a few paleta places since being down here and I opt for the chocolate and sprinkles almost always. Oh yum! Coconut-y coffee goodness dipped in chocolate with sprinkles – this has me written all over it. I hate drinking coffee, but I am obsessed with coffee in my ice cream and popsicles. By the way, I keep dancing exclusively in my head! Yum!! AND I just made some peanut butter fudge popsicles…in the freezer even as I type this…thanks Megan!~!